Contains 175 mg caffeine. Caffeine intake is not advisable in cases of high blood pressure, heart problems, pregnancy or nursing. Limit caffeine intake. Too much caffeine may cause nervousness, irritability, sleeplessness and occasionally, rapid heartbeat. For adult use only. Use only as directed. For a delicious protein shake, mix 1 scoop of CARNIVOR SHRED with 6-8 fl. oz. of cold water in a shaker bottle. Protein may foam after mixing. Take 1-2 times daily. Very low calorie diets (below 400 calories per day) may cause serious illness or death. Do not use for weight reduction in such diets without medical supervision. Not for use by infants, children or pregnant or nursing women. Keep out of reach of children. For adult use only. Use only as directed. 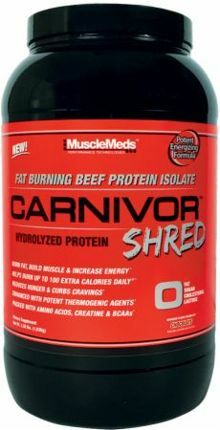 CARNIVOR-BPI [Hydrolyzed Beef Protein Isolate, Creatine Monohydrate, Anabolic Nitrogen Retention TechnologyTM Intermediates: GKG (Glutamine-Alpha-Ketoglutarate), OKG (Ornithine-Alpha-Ketoglutarate), AKG (Alpha-Ketoglutarate) And KIC (Alpha-Ketoisocaproate), BCAAs (L-Leucine, L-Valine, L-Isoleucine)], Maltodextrin, Cocoa, Natural & Artificial Flavors, Salt, Silica, Acesulfame Potassium, Sucralose, Antifoam (Propylene Glycol Mono – And Diesters Of Fats And Fatty Acids, Mono Glyceride Of Fatty Acid, Polyglycerol Oleate, RDB Soybean Oil, Dimethylpolysiloxane, Hydrophobic Silica, Polysorbate 60K, Sorbitan Monostearate, Contains Less Than 2% Of Paraffin).